One Room Challenge land is a very different animal this time around. Last time, we were starting from studs and there was SO much to do every week. Now that we are basically just furnishing a finished room, I feel like there is not that much to share with you guys! Luckily, we were digging around in our attic and I found our post for the week. Enter in this old fox hunt print. When I pulled this framed print out of our attic, I literally heard Auston say "Really?" I just had to look past the incredible ugly mat and frame and see this incredibly manly fox hunt print begging to be used. The first step was to get it out of the frame and remove the pink mat. If you're a smart person you have a yard stick and an exacto knife, but obviously I am not a smart person. The biggest debate I had on this small project was if I should keep the existing frame and paint it black. 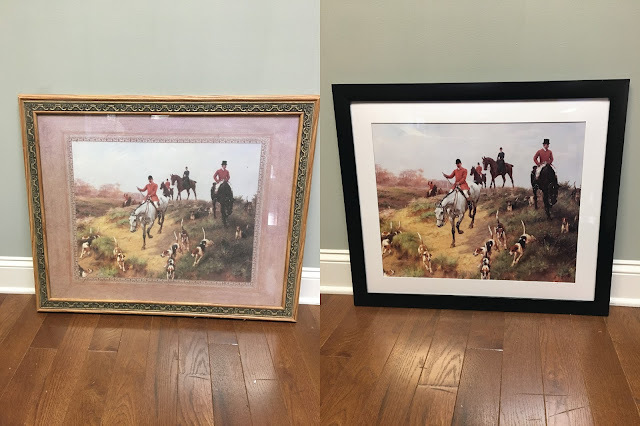 After looking at several options, I decided the decorative lines of the existing frame were just too decorative because this print should get all the attention. I settled on this simple 20x24" matte black frame that was only $15. Once I got the print in, I knew it was the right choice. Now your eye is drawn to the beautiful landscape and those pretty red coats. The plan is to hang it above the bar cart where it can ooze manliness. I seriously couldn't be more excited to salvage this print and that it only cost $15. It's hard to see what a difference the new frame makes until you see them side by side. Even though the black frame is slightly smaller than the original, it actually makes it look bigger. P.S. In no way do I condone the act of hunting foxes for sport. I actually am avidly against the cruelty these animals face along with several other species. Don't get me wrong, I'm not against hunting, but I am against hunting for sport. You can donate to the League Against Cruel Sports among other charities to help the cause and leave a comment if you know of any others. As always, check out the other Guest Participants on Calling It Home and the featured bloggers below. Come back next week to see what we have up next! I love it! It looks so much better. Great work!